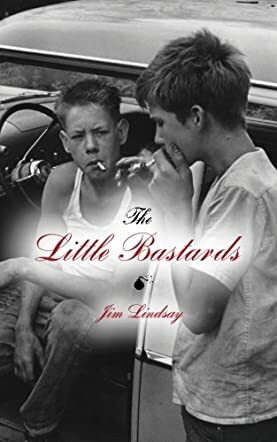 The Little Bastards is a coming of age novel written by Jim Lindsay. It's set in Willamette, a small town in Oregon, during the 1950s. The reader first encounters the narrator, Sonny Mitchell, when he's just turned fourteen and it's late summer. He and his pal, Joe, race off to a railroad trestle to see the train crash that has left one person dead and several others injured. Joe and Sonny are the youngest members of the group they hang out with and are the only ones who've never seen a dead body. They race madly through town, only to catch a mere glimpse of the ambulances and a sobering view of the catastrophe. Their group is known as the Little Bastards, a name originally bestowed on them by the lumber yard watchman whose life they've made miserable, that they adopted as a badge of honor and identity. Jim Lindsay's coming of age story is richly evocative of the life and times of small-town kids during the 1950s. I quickly was immersed in Sonny's tale as he and his friends graduate from frantic bike rides around town while reading all about hot rods to actually working on and riding in their own, while listening all the while to the latest rock and roll music on the radio. The descriptions of the environment, the cool foggy days of western Oregon and the clubhouse hidden in blackberry thickets where the kids hang out, smoking cigarettes and listening to 45s are fabulous. Equally fascinating is the way Lindsay's narrator walks the reader through the intricacies of modifying cars and conveys the excitement of the drag races held on Otto's farm and the formalities of challenging racers. Add in the local high school girls who are just starting to appreciate these kids from the wrong side of town, and you've got the combination for a great story -- and it rides beautifully.